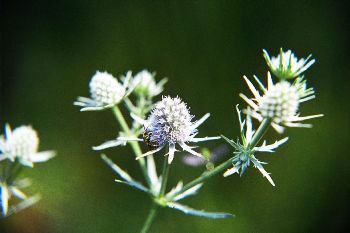 Foliage: stiff, upright, branched stem, with narrow, pinnately veined leaves. Leaves are not parallel veined to the mid-rib. Upper leaves sessile. 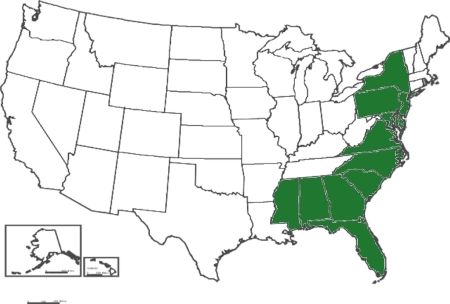 Range in New Jersey: Middle district and Coastal strip. Misc. USDA lists as an obligate wetland species; i.e.,��Occurs almost always (estimated probability 99%) under natural conditions in wetlands. Stone lists as "common" on the salt marshes of the coast from Spring Lake southward, and locally along Delaware Bay and the lower Delaware River, also on tidewater streams some distance from the shore. 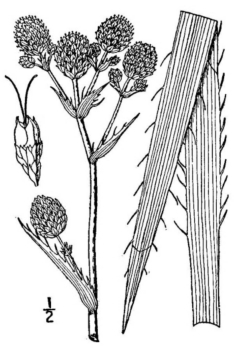 "A peculiar plant, usually growing with sedges, grasses and other vegetation, its large compound umbels of bluish heads and spiny involucres presenting a peculiar misty appearance at a distance against the dark green of the salt meadows."